The job of an interior designer is to maximize the area that they are working on. Nowadays, clients can choose from a vast option of partition materials available for dividing rooms and maximizing spaces. 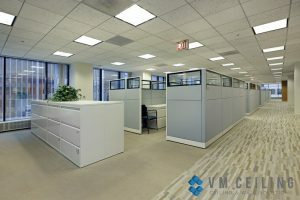 False ceiling and wall partition contractors are usually connected with several interior designers. Such interior designers are also usually experienced in room partitions and the necessary materials suitable for a specific type of partition wall. When working with intricate and lucrative designs, it is important to work well with contractors and interior designers. Regardless of the industry, offices must always have a well-designed area in order to enhance its overall appeal, especially to clients. Additionally, having a brighter ambiance makes it a more conducive working space. Partition walls are also an essential part of offices as they divide the whole space into different sections for each department. Offices commonly use drywall, wooden, and glass partitions to separate cubicles, which then gives each employee their own personal space. It does not only centralizes the working area but also helps the employees to connect efficiently. Office partitions can either be temporary or permanent, which is the same for living room partitions and room partitions. 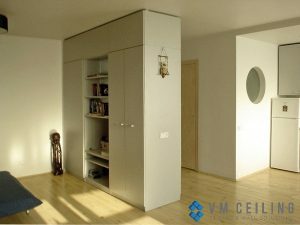 If you are residing in a one bedroom flat and require extra space for your children, you can divide the living room with partitions. Use wooden or drywall partitions to create individual rooms for the kids. Using various types of partitions, you can even create an attached bathroom in your room. If your room is bigger usual, you may also use partitions to divide the room into sections. Timber wood is considered the perfect material to use for partitions in order to give a more traditional and classic touch. It doesn’t require painting and can be decorated using fewer materials than usual partitions. Wood partitions are mostly preferred in offices and hotels. Wood partitions often make an atmosphere feel more relaxed. Whether it is in a reception area, a general office, or a conference room. Timber partitioning can also be mixed with other wall partition materials like glasses, to give it a more advanced and complex look. Additionally, one of the biggest advantages of wood partitions is that it is fire resistant. Metal or aluminium partition is widely used in offices. They are not meant for houses and residential purposes. Aluminium partitions are mostly used in offices with manufacturing units inside the complex. It is widely used in shopping malls as well. 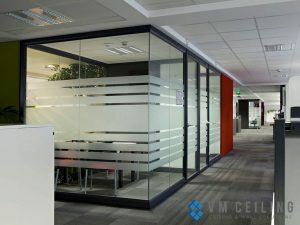 Glass partition is a more lucrative type being used in most places. If you have an extra space at home, you can choose to construct a glass partition in your living room to create an overlooking view of the garden. It gives an illusion of a larger space, which makes any area appear bigger than it really is. Installing artificial lighting in the glass partition is also a great way to decorate your place. Modern homeowners are even using bamboo shoots inserted inside the glass partition in order to give houses and offices visually appealing. However, the only downside is that glass partitions are not fire resistant and they may catch fire very fast. It must then be installed in areas where there is less exposure to heat. Drywall partition is usually the best material for houses, offices, and other places. It is highly cost-effective, eco-friendly and flexible. Compared to other types of materials, drywall is also extremely lightweight. The drywall partition does not require much water for installation and is a great thermal insulator. If you want to establish an energy cost saving partition in addition to being soundproof and fire resistant, then nothing is better than a drywall partition. Drywall partition is made out of gypsum boards that are 100% eco-friendly. The walls can be painted and decorated based on your personal preferences. Apart from that, the drywall partition is a permanent fix to all your problems. It does not require any regular cleaning and maintenance. 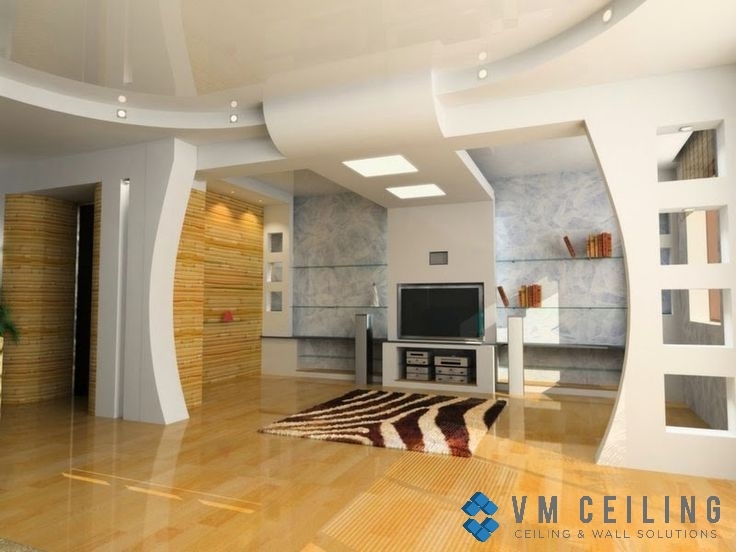 At VM False Ceiling Singapore, we provide a range of premium quality false ceiling and partition wall services. Our experienced and dedicated team ensures that all out installation services are carried out with outstanding workmanship – bringing out the best in your space! See it for yourself and browse our successful projects here. While you’re at it, read through our range of false ceiling and partition wall articles. For any enquiries, don’t hesitate to contact our friendly staff. Call us now at+65 6653 2620 or email us at enquiry@vmceiling.com. Which One is the Best – Drywall Ceiling or Suspended Ceiling?